You have reached ARTSCAPE 02-3612 Artscape Iris Window Film 24" x 36" in Findsimilar! Our expertise is to show you Kitchen items that are similar to the one you've searched. 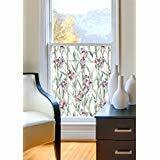 Amongst them you can find Artscape Savannah Window Film 24" x 36", ARTSCAPE Summer Magnolia Window Film 24" x 36", ARTSCAPE Oak Knoll Window Film 24" x 36", Artscape New Leaf Window Film 24" x 36", Gila Window Film Complete Installation Kit, Artscape 02-3007 Clematis Window Film 24" x 36", ARTSCAPE Eucalyptus 24 x 36in Window Film, ARTSCAPE Veranda 24 in. x 36 Window Film 1 Green, ARTSCAPE Wild Rose Window Film 24" x 36", Artscape 01-0106 Wisteria Window Film 24" x 36", all for sale with the cheapest prices in the web.